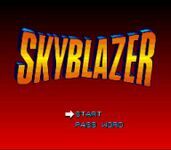 Skyblazer is a videogame released for the SNES in 1994 by Sony imagesoft. It is platform game in which the player controls the character Sky. The objective of the game is to rescue the sorceress Arianna, who was kidnapped by Ashura. The player can kick and punch to defeat enemys as well as use 8 special attacks which require magic power. The game consists of 17 levels. In some of the levels the player has to fly. The game uses Mode 7 in some of these flight levels as well as in a number of bossfights.